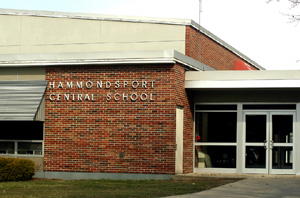 HAMMONDSPORT—After a budget update, March 17, the Hammondsport school district is looking at a proposed 4.65 percent tax levy increase, but wants to get the increase down to 1.9 percent. Superintendent Kyle Bower said the school board is going to look at more cuts to the budget by the April meeting, to bring the proposed tax levy increase down to at most 1.9 percent. He added that despite the tax levy increase, spending compared to last year is the same. Bower said the proposed budget is at $12,075,323, with no increase in spending. However, he explained that because of a $500,000 loss in revenue, the board has to close the gap. He said the 4.65 percent tax levy increase already includes a number of cuts. Bower said the proposed budget includes the retirement of three full-time and two part-time staff. He added another one-time cut is fewer utilities at the Curtiss school, as the students are being phased over to the main campus. Reorganizing the bus garage will also save $70,000 a year. This still leaves the school with approximately $200,000 to cover to get a 1.9 percent tax levy increase. Bower said the school board will have to consider using fund balance monies, decrease staffing, or an increase in the tax levy. “I don’t think anyone wants to see that,” he said. The school board meets Wednesday, April 14, at 7 p.m.